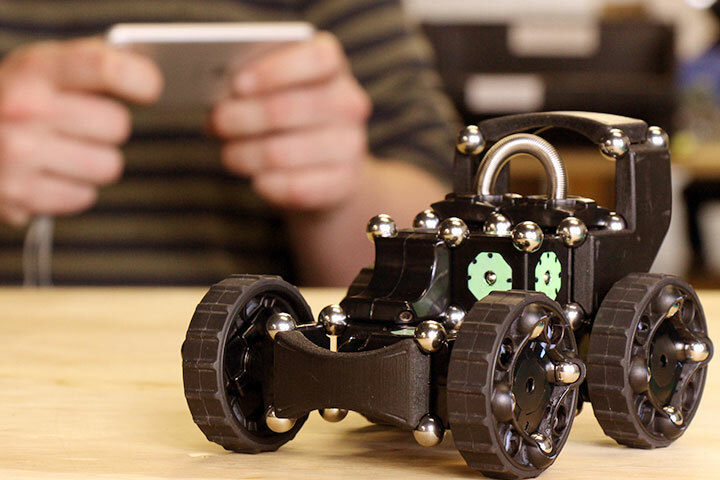 Engineers have developed magnetic robot construction kits which enable you to build your own smartphone-controlled toy robots that can drive and wiggle. The robot construction system, called MOSS, uses over-moulded neodymium (a rare earth metal), magnets and carbon steel ball bearings to build a wide variety of tiny robots. The system developed by Modular Robotics in Boulder, Colorado, does not require coding or wiring your construction. By attaching a Bluetooth module, players can control the robots remotely using a smartphone or tablet. MOSS was created over two-and-a-half years and has been through numerous stages of development, its makers say. The blocks can be put together in many different ways to create unique robots, according to the company, which launched the system on crowdfunding website Kickstarter. "We're already making MOSS, so we don't need the Kickstarter funding. But it seems like the place where people look for cool new tech products," CEO and design director Eric Schweikardt said. The robots are powered with a rechargeable lithium polymer battery. Users can plug in with the included microUSB cable to recharge. The final version of the robot kits are expected to be ready as early as January or February.